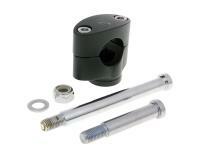 CNC machined MX handlebar adapter to mount a handlebar with 28.6mm diameter on motorcycles & mopeds with fork bridge. The package includes two different lengths of M8 fastening screws (70 and 120mm). It is supplied a single handlebar clamp.